In figurative painting and self-portraiture, Shimoyama creates vulnerable yet resilient depictions of African American boyhood and masculinity. His work challenges cliché with daring and personal representations of the complexities of race and sexuality. 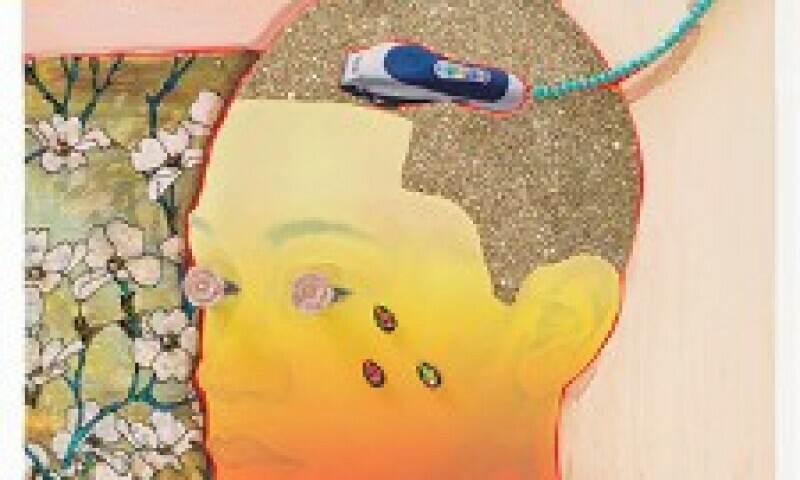 In his recent barbershop paintings, Shimoyama transforms the hyper-masculine social space into queer fantasy where feminine glamour and fashion take over, and tender depictions of boys don floral capes and glitter-encrusted hair. Born in 1989 in Philadelphia, Shimoyama received his Bachelor of Fine Arts in drawing and painting from Pennsylvania State University in 2011, and his Master of Fine Arts from Yale University School of Art in 2014. Shimoyama has exhibited widely at galleries throughout the United States, including De Buck Gallery, Lesley Heller Gallery, and Bravin Lee Programs in New York; Samuel Freeman Gallery in Los Angeles; Alter Space in San Francisco; and Emmanuel Gallery in Denver. His work was also included in Realities in Contemporary Video Art at the Fondation des Etats Unis, in Paris in 2015. In 2019, Holland Cotter selected Shimoyama as one of the The New York Times’ 19 Artists to Watch, His work has been written about in The Los Angeles Times, New American Paintings, Pinwheel, the blog Filthy Dreams, and Saatchi Art. In 2016, Shimoyama was named the winner of the Miami Beach PULSE Prize at PULSE Miami Beach. He is currently represented by De Buck Gallery in New York, and is the Cooper-Siegel Assistant Professor of Art in the School of Art at Carnegie Mellon University. Shimoyama lives and works in Pittsburgh.